The Second Loan Exhibition of Old Masters: British Paintings of the Late Eighteenth and Early Nineteenth Centuries, Detroit Institute of Arts, 1926, no. 9, repro. Exposition Rétrospective de Peinture Anglaise (XVIIIe et XIXe siècles), Musée Moderne, Brussels, 1929, no. 66. Eighteenth Century English Painting, Fogg Art Museum, Cambridge, Massachusetts, 1930, no. 23. Landscape Painting, Wadsworth Atheneum, Hartford, Connecticut, 1931, no. 61, repro. Paintings and Drawings by Thomas Gainsborough, R.A., Cincinnati Art Museum, 1931, no. 22, pl. 42. Century of Progress: Exhibition of Paintings and Sculpture, Chicago World's Fair, Art Institute of Chicago, 1933, no. 192, repro. Thomas Gainsborough, Tate Gallery, London, 1980-1981, no. 148, repro. Gainsborough, Grand Palais, Paris, 1981, no. 71, repro. Glorious Nature: British Landscape Painting, 1750-1850, Denver Art Museum, 1993-1994, no. 16, repro. Thomas Gainsborough, 1727-1788, Tate Britain, London; National Gallery of Art, Washington, D.C.; Museum of Fine Arts, Boston, 2002-2003, no. 146, repro. The medium-fine canvas is plain woven; it has been lined. The ground is dark pinkish brown; although thinly applied it contributes substantially to the overall tonality, especially in areas of the sky and background mountains, where the overlying paint has been applied very thinly. The painting is executed in thin, fluid layers except in the highlights, with fairly short, pronounced brushstrokes. The sky has been extensively repainted except in the clouds, probably due to severe abrasion. The thinly applied natural resin varnish has discolored yellow to a considerable degree. Preliminary Catalogue of Paintings and Sculpture. National Gallery of Art, Washington, 1941: 72, no. 107, as Landscape with a Bridge. Book of Illustrations. National Gallery of Art, Washington, 1942: 241, repro. 14, as Landscape with a Bridge. Paintings and Sculpture from the Mellon Collection. National Gallery of Art, Washington, 1949 (reprinted 1953 and 1958): 122, repro., as Landscape with a Bridge. Cairns, Huntington, and John Walker, eds., Great Paintings from the National Gallery of Art. New York, 1952: 132, color repro., as Landscape with a Bridge. Shapley, Fern Rusk. Comparisons in Art: A Companion to the National Gallery of Art, Washington, DC. London, 1957 (reprinted 1959): pl. 144, as Landscape with a Bridge. Waterhouse, Sir Ellis. Gainsborough. London, 1958, no. 1008, pl. 287. Reprint. 1966, color repro. Cooke, Hereward Lester. British Painting in the National Gallery of Art. Washington, D.C., 1960 (Booklet Number Eight in Ten Schools of Painting in the National Gallery of Art, Washington, D.C.): 28, color repro., as Landscape with Bridge. Hall, Douglas. "The Tabley House Paper." Walpole Society 38 (1962): 70, 114. Walker, John. National Gallery of Art, Washington, D.C. New York, 1963 (reprinted 1964 in French, German, and Spanish): 319, repro. Summary Catalogue of European Paintings and Sculpture. National Gallery of Art, Washington, 1965: 54, as Landscape with a Bridge. Cairns, Huntington, and John Walker, eds. A Pageant of Painting from the National Gallery of Art. 2 vols. New York, 1966: 2:352, color repro. Cooke, Hereward Lester. Painting Lessons from the Great Masters. London, 1968: 46, fig. 32; 138, detail repro., color repro. opp. European Paintings and Sculpture, Illustrations. National Gallery of Art, Washington, 1968: 46, repro., as Landscape with Bridge. European Paintings: An Illustrated Summary Catalogue. National Gallery of Art, Washington, 1975: 142, repro., as Landscape with Bridge. Walker, John. National Gallery of Art, Washington. New York, 1975: no. 498, color repro. Watson, Ross. The National Gallery of Art, Washington. New York, 1979: 93, pl. 81. Hayes, John. 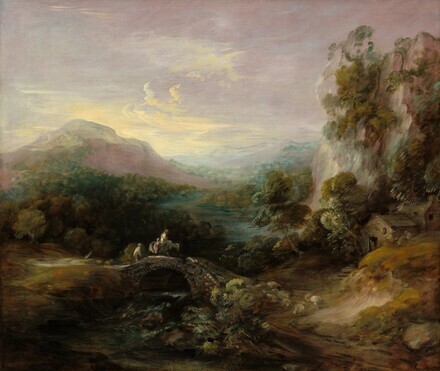 The Landscape Paintings of Thomas Gainsborough. 2 vols. London and New York, 1982: 1:145, 147, 171, 231, pls. 179, 203; 2: no. 151, repro. Walker, John. National Gallery of Art, Washington. Rev. ed. New York, 1984: 357, no. 496, color repro., as Landscape with Bridge. European Paintings: An Illustrated Catalogue. National Gallery of Art, Washington, 1985: 165, repro. Hayes, John. British Paintings of the Sixteenth through Nineteenth Centuries. The Collections of the National Gallery of Art Systematic Catalogue. Washington, D.C., 1992: 97-99, color repro. 99. Hand, John Oliver. National Gallery of Art: Master Paintings from the Collection. Washington and New York, 2004: 276, no. 222, color repro.